There is no denying the sheer size of the Right Whale. They can weigh up to 100 tons as well as be up to 60 feet long. One way to correctly identify them is through the calluses on their heads. They also have a blowhole that is V shaped so it is unique compared to other types of whales. They are either dark gray in color or black. They are about 50 feet in length and can weigh as much as 70 tons. 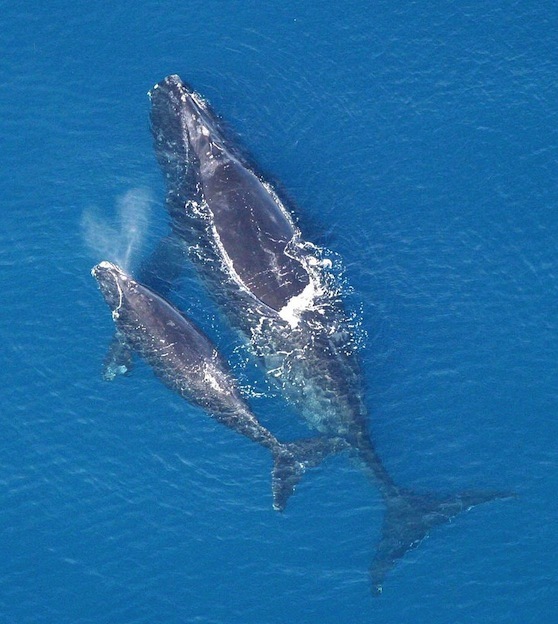 You won’t find very much information about the behaviors and lives of the Right Whale. They have been difficult to research due to the limited numbers of them out there. It is known that they live in not very large groups. A Right Whale has a huge mouth with at least 200 plates on each side of it. They eat a variety of small items including krill and crustaceans. As they move along in the water at a slow pace, they have their mouths open. This way they can take in everything they come across and filter out what they don’t need. They are willing to go where they need to in the water in order to find food. This is why something they feed near the surface and other times they are at the floor of the water. There are four distinct groups of Right Whales that have been identified. Close to 400 of them are believed to live in the North Atlantic. Approximately 25 are in the North Pacific and approximately 15,000 are found in the Southern regions. An interesting fact has to do with the size of the testicles on a Right Whale. Each one ways close to 1,000 pounds. Researchers believe that this helps them to produce the volume of sperm necessary to increase the chances of conception. Maturity occurs between 7 and 10 years of age. The females only produce offspring once every 3 to 4 years. The gestation period is a full year as well. When the calves are born they weight close to one ton. They are also about 20 feet in length. Many people find the name of the Right Whale to be one that is strange. The name comes from the fact that the early killers of them felt that this was the right type of whale to be after. Before they had all the tools they do now, it was difficult to get these larger whales out of the water. However, the Right Whale floats when it dies and that made the process much easier for them. Since the Right Whales often stay very close to the shore, they are very popular for people to watch. However, their numbers are extremely low so aggressive methods of conservation continue to offer them hope of survival. There are less than 20,000 total of them found in the world at this time. They can live around 70-100 years of age if we can get the conservation efforts to fully protect them. One of the leading causes of death for the Right Whale is due to head injuries. They are often sustained due to collisions with the large ships that frequent their habitat. Research has been done to identify the patterns of these whales though to do their best to route ships out of their main destinations.